Buses and coaches produced by Bristol Commercial Vehicles Ltd. have always been high on the list of favourites of the British bus enthusiast. We are also fortunate to have a number of events that feature these fine vehicles. This DVD programme covers both of these aspects as we visit Bristol, Warminster and the Transport Museum at Wythall in the West Midlands to see these buses and coaches in action. Our programme starts at the Harbourside rally in May 2015. Here we record the buses taking up their duties at the site and follow some of them around the streets of Bristol. These locations include Cannons Way, Anchor Road, The Centre and back at the rally site. 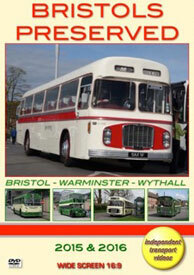 Bus companies represented are the Bristol Omnibus group, Crosville, Western National and Abus. We also see some non-Bristol types from the fleets of South Wales Transport, Warrington Corporation and Bristol Cityline. Our second rally visit is also in Bristol. This time at the Brislington Park & Ride site in August 2015. Here we record the vehicles arriving in the bright morning sunshine, including Bristol Lodekkas, ‘K’ and ‘L’ types, REs and MWs, as well as non-Bristol buses and coaches. Again former Tilling fleets are represented, but the majority are from the Bristol Omnibus group of companies. Our cameras also take a brief visit to the city centre to see the preserved vehicles in action. Filming concludes at the rally site with plenty of action for you to enjoy! Our third event was billed as the ‘Warminster Bristol RE Running Day’, but due to some non-available REs, other Bristol types were substituted making it a most enjoyable event. Filming is centred around the ‘Coach Station’ and Station Road in the Wiltshire town of Warminster in April 2016. Here we see many Bristol RE types, such as RELL buses and RELH coaches in action. Fleets represented include Crosville, Hants & Dorset, Wilts & Dorset, Bristol Omnibus, Southern National and Royal Blue. We also see a Bristol MW and a Bristol LH from Bristol Omnibus and a Bristol VR from Damory Coaches. Our cameras take two rides on Bristol RELH coaches for comparison. The first is to Beckington onboard former Red & White RC.968 (OAX 9F) a RELH with a Leyland 0.680 engine. The second trip is to Codford and Heytesbury onboard former Crosville CRG103 (AFM 103G), which is a RELH with a Gardner engine – hear the difference! Our filming concludes in the Market Place and at the ‘Coach Station’, a most enjoyable day, I am sure you will agree! To conclude our ‘Bristols Preserved’ programme we take a brief ride on former Cheltenham District 1000 (KHW 306E), which was the first Bristol RELL6L with ECW B53F body to enter service with the Bristol Omnibus group. This bus is now resident at The Transport Museum, Wythall in the West Midlands. We hope that you enjoy this review of preserved Bristol buses and coaches as they come back to life at these lovely events.